Life in the Premiership wasn’t supposed to be this straightforward for newly-promoted Hearts, was it? A jubilant home support bounded out of Tynecastle bragging about being top of the league after a comfortable victory over a subdued Motherwell side maintained one of only two 100 per cent records in the top flight – Aberdeen possess the other. News that Celtic had slipped up against Kilmarnock, paving the way for Robbie Neilson’s side to move two points clear at the summit, merely added to the buzz around Gorgie after goals in either half from Gavin Reilly and Billy King secured a convincing win. They have now won each of their opening three league games in the top flight for the first time since George Burley’s much-vaunted team set the heather alight a decade ago. With a run of games against Ross County, Partick Thistle and Hamilton, it is difficult to see this momentum-gathering side slipping up any time soon. Head coach Neilson had revealed in Tuesday’s Evening News that he planned to make changes to the side that started at Dundee in order to rest some weary legs. Few expected that man-of-the-moment Juanma Delgado would be among those to drop out, however. The Spaniard, who had scored three goals in his previous two outings, was one of three players, along with Jamie Walker and Blazej Augustyn, omitted from the side that won at Dundee on Saturday. The Polish defender was out of the squad altogether while the two attackers were named on the substitutes’ bench. Sam Nicholson, the opening-weekend match-winner against St Johnstone, returned to the starting line-up, while King and Reilly came in for their first league starts. Motherwell, with three points from their previous two games, handed a debut to on-loan Reading midfielder Jake Taylor, while Louis Moult came in to replace the injured Wes Fletcher as Scott McDonald’s partner in attack. 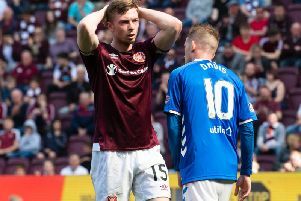 Hearts, backed by a sell-out crowd on a glorious summer’s evening in Gorgie, started on the front foot and Nicholson almost beat Motherwell goalkeeper Connor Ripley with a curling right-footed effort from 20 yards out which drifted agonisingly wide after just two minutes. The Jambos looked in the mood early on and, two minutes later, Osman Sow got himself into a dangerous position when he nicked possession from Louis Laing outside the box and surged towards goal, but Stephen McManus got back to make a crucial tackle just as the big Swede looked like giving the hosts the lead. Motherwell threatened for the first time in the 18th minute when Scott McDonald headed a Lionel Ainsworth cross straight into Neil Alexander’s arms from eight yards out. Two minutes later, Hearts survived a major scare when McDonald dispossessed Prince Buaben just outside the box and slipped the ball through to Louis Moult, but the Ghanaian midfielder got back to make amends with a saving tackle as the Motherwell striker took too long to get his shot away. The hosts went close to an opener in the 29th minute when Igor Rossi saw a header deflected behind from a King corner. But they took a deserved lead three minutes later, after being awarded a penalty for the third league game in succession when Nicholson was clipped by McDonald as he burst into the box at pace. Referee Brian Colvin was perfectly positioned and swiftly pointed to the spot. It was notable that McDonald’s anger appeared to be with himself rather than the officials. With Sow having missed from the spot against St Johnstone on the opening weekend and Juanma, who scored a penalty at Dundee on Saturday, not on the field, it was left to Reilly to do the honours. The former Queen of the South forward made no mistake in sending Ripley the wrong way. With their tails up, the hosts should have increased their lead five minutes later, but Buaben glanced a free header wide from a Nicholson cross. Reilly then unleashed a firm shot from the edge of the area, but Ripley was equal to it. After a lull at the start of the second half, Hearts came to life in the 55th minute when a slick build-up created an opening for King on the edge of the box, but the winger was unable to get the ball under control and Ripley was grateful to collect. A minute later, a sharp build-up involving King and Nicholson resulted in Reilly having another low attempt from the edge of the box saved by Ripley. The Hearts support were roused in the 59th minute when Juanma was sent on in place of Sow. Soon after the introduction of the revered Spaniard, King had a low angled shot deflected inches past as Hearts stepped things up a notch and, from the resulting corner, Rossi’s goalbound header was blocked on the line by Laing. King, sporting bright pink boots, had grown into the game and it was he who put his side in total command. The winger collected possession wide on the right, stepped inside and, from the angle of the penalty box, drilled a low left-footed shot past a ruck of Motherwell defenders and right through the hands of Ripley before spinning up into the roof of the net. The Hearts support were in raptures and they were further roused when Juanma made his first notable imprint on the game in the 73rd minute. The Spaniard collected the ball on the half-way line, pinged a lovely pass out to the right for Callum Paterson and was only inches away from connecting when the marauding right-back sent a tantalising delivery across the face of goal. Hearts (4-4-2): Alexander, Paterson, Ozturk, Rossi (McGhee 83), Oshaniwa; King, Buaben, Gomis, Nicholson; Sow (Juanma 59), Reilly. Unused subs: Hamilton, McHattie, Walker, Oliver, McKirdy. Motherwell (4-4-2): Ripley; Law, Laing, McManus, Hammell; Ainsworth, Lasley (Leitch 67), Taylor, Johnson, McDonald, Moult (Thomas 76). Unused subs: Twardzik, Chalmers, Kennedy, Clarkson, Cadden.